Select camp period checkbox and related duration per day. Each morning the Campers gather for a 15 minute full group warm-up. After warm-up campers are divided into groups of no more than 8 per coach and will stay with the same morning coach and group all week. They learn progressive gymnastics skills on each of the following: bars, balance beam, floor (tumbling), rope, zip line and the trampoline. Each day the Campers complete an art project and have a freeze popsicle break, provided by Silver Stars. Our program utilizes the newest and most imaginative gymnastics equipment especially designed for the pre-school child. Beyond gymnastics, children practice how to stay in line, take turns, and follow instructions from the coach. Our camp program is designed to teach body awareness, flexibility, and strength in a fun and interactive environment. Afternoon Camp is filled with fun and structured play. 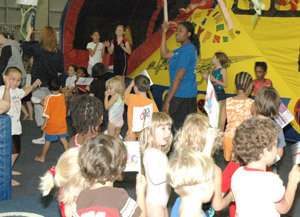 The afternoon campers are divided by age and participate in a variety of activities. These include arts and crafts, trampoline, cartwheel station, gymnastics games and practicing for the Friday Show. Silver Stars Gymnastics provides an afternoon freezepop break. From 3:30-4:30 all of the Campers gather together for a planned full group activity.